Hydra is a very beautiful island, a real historical gem and is steeped in a seafaring tradition of a bygone age. The entire island is a preserved national monument and has retained all its 17th and 18th Century charm and authentic quaintness. Hydra's spectacular attractive harbour remains hidden from sea view, until just before you enter the port. A beautiful horsehoe of white painted, red tiled houses and huge mansions that cascade down to the harbour, packed with cruise ships, fishing boats, yachts and water-taxis, making Hydra one of the most photographed, filmed and painted harbours in the whole of Greece. In 1956*, Sophia Loren and Alan Ladd filmed 'Boy on a Dolphin' on the island, where a statue opposite Phaedra's windmill stands today to commemorate this historic international cinematic event. Hydra is very cosmopolitan, attracting thousands of visitors by its numerous charms. It gets very busy from Easter to September. In the past, the island has attracted famous writers, musicians, artists and celebrities. Poet and singer Leonard Cohen (pictured right) lived here during much of the 1960s, as did Henry Miller, Allen Ginsberg and David Solway. Members of the Rolling Stones and Pink Floyd, even Joan and Jackie Collins have been spotted on the island. Just recently, Nicole Kiddman bought a house on Hydra. The charm of Hydra is increased by the fact that there are no private vehicles or motorbikes on the island. All transport is by donkey for all activities of life, including the transportation of luggage and sightseeing. Donkeys are far better suited to the narrow stepped streets of the town. For places and beaches further along the coast, you can rent a water-taxi from the main harbour. Art exhibitions and music festivals are organised throughout the year, especially during the high season, where many artists who live on the island exhibit their work. The towns Maritime Museum is full of interesting historical nautical and seafaring artefacts, located close to the main passenger boat arrival and departure point. Admission: 5 Euros. Visit and enjoy the wonderful views from the monastery of Profitis Ilias and the convent of Ayai Efpraxia to the South. There is also a dirt road which takes you to the high plateau of Episkopi, from which footpaths take you to the Western end of the island. A shorter 20 minute coastal walk, from the harbour, will take you along a paved pathway to the traditional fishing hamlet of Kamini (pictured left). 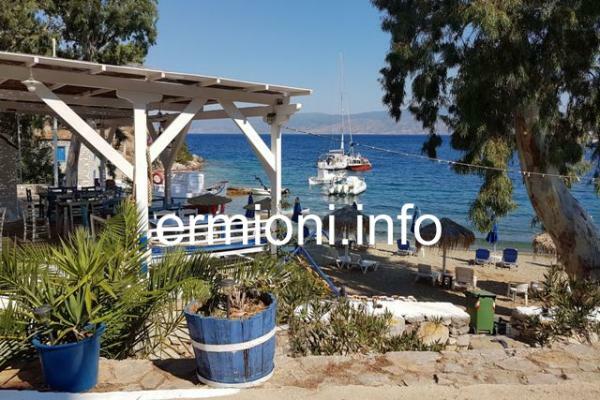 A small walk-through taverna on the way to Kamini offers wonderful fresh food with picturesque views of the sea and passing boats. A 30 minute coastal walk from the harbour, in the opposite direction (North-East) will bring you to the popular Mandraki beach, offering a clean sandy beach with many sunbeds and shade. 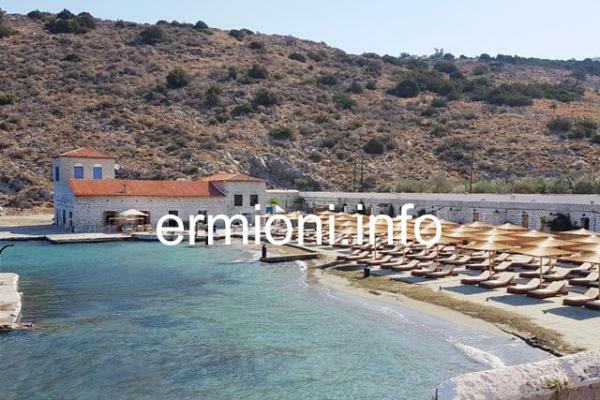 Close by, there is a small authentic taverna by the sea, offering fresh food and cool drinks. The town of Hydra has everything the visitor could ask for, many smart boutiques and galleries, gift shops selling art, paintings, souvenirs, hand-made jewellery and textiles, and a variety of restaurants, tavernas, cafes and bars. The town is very compact that everywhere and everything is within a short walking distance. Hydra gives visitors the opportunity to experience the island's old way of life in a modern environment. Hydraean sea-captains' mansions, have been converted into hotels and guest-houses with local style and colour. Nestled in splendid gardens are fine restaurants for a variety of tastes. Small traditional tavernas which offer the day's catch accompanied by wine straight from the barrel, and quaint ouzo bars that grill octopus over hot coals along the backstreets behind the harbour. Try to visit Hydra towards the end of June, to celebrate the islands contribution to the Greek War of Independence, which is referred to as the 'Miaoulia' festival. Named after Admiral Andreas Vokos, nicknamed 'Miaoulis', he was Greece's Nelson, who scattered the Ottoman navy with the use of fire-ships. The week-long festival ends on the third Saturday of June and includes a re-enactment naval battle and firework display by the main harbour. A statue of Admiral 'Miaoulis' (1769-1835) is located within an elevated cannon enplacement at the entrance to the main harbour, where he continues looking out over the blue Aegean sea. There is also a festival of traditional Greek 'shadow' puppets, held towards the end of June. At the centre of the port, behind the clock-tower, there is the Metropolis church of Hydra, dedicated to the Assumption of the Virgin. The original church was built in 1648, and reconstructed in 1774 following a major earthquake. The smaller of its two bell-towers dates back to 1806, the larger tower has a clock, and a bell weighing about 2 tons. The church also served as a monastery, today the restored monastery cells house the Mayor's office and a small Ecclesiastical museum. Admission to the museum: 2 Euros. 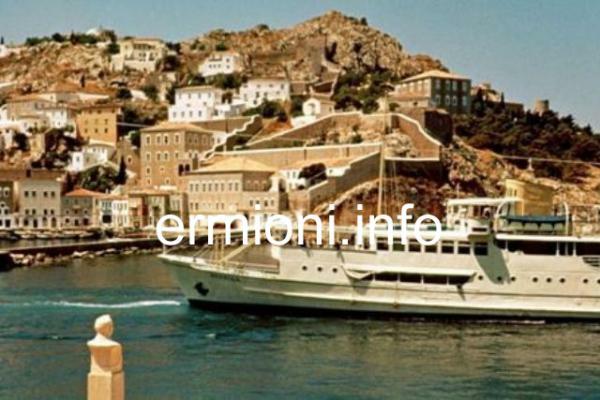 From Ermioni, Hellenic Seaways tickets for Hydra can be purchased from Pop's tourist office, Tel: +30 27540 31514, in the Limani square, prior to departure. 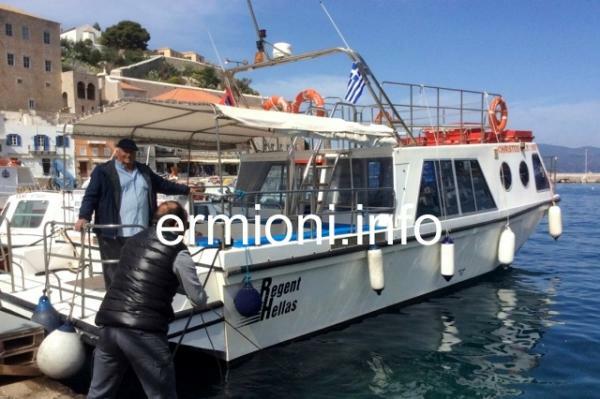 Contact: hellenicseaways.gr/en for the actual sailing times. The sea crossing from Ermioni to Hydra takes approximately 25 minutes. Tickets cost 8.00 Euros per person, one way. During the height of summer, the island of Hydra gets very busy and crowded. Please do ensure you are on the right Hellenic Seaways boat for your return journey back to Ermioni, as some boats arriving at the set time could be sailing directly to Piraeus. There is also a sea crossing offered by SpeedLine on the Christos motor speed-boat, with additional sailing times during the day. 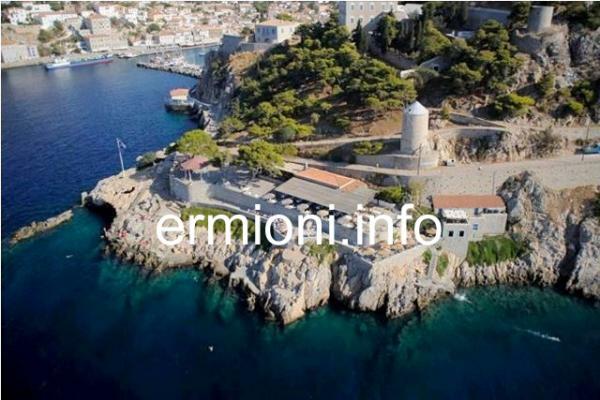 Tickets can be purchased from Pop's tourist office, in Ermioni, prior to departure. Tel: +30 27540 31514 or +30 697 724 8369 and +30 698 358 8769 . Contact: hydratourstravel.gr or Tel: +30 698 122 2550 for the actual sailing times. The sea crossing from Ermioni to Hydra takes approximately 35 minutes. Tickets cost 7.50 Euros per person, one way. There are many boat transfers from the small port of Metohi to Hydra, situated approximately 19kms East of Ermioni, opposite Hydra town. The sailing operators are the original Hydra Lines with the Freedom II and Freedom III motor boats. The sea crossing from Metohi to Hydra takes approximately 25 minutes, and the ticket price is 6.50 Euros per person, one way. There are daily sailings from Metohi and Hydra throughout the year, usually every 2 hours, with additional sailings during the high Summer months. Check actual daily sailing times from the contact link below, especially during national and public holidays. Hydra Lines contact: www.hydralines.gr or +30 6947 325 263 or +30 6944 242 141 for the confirmed sailing times. 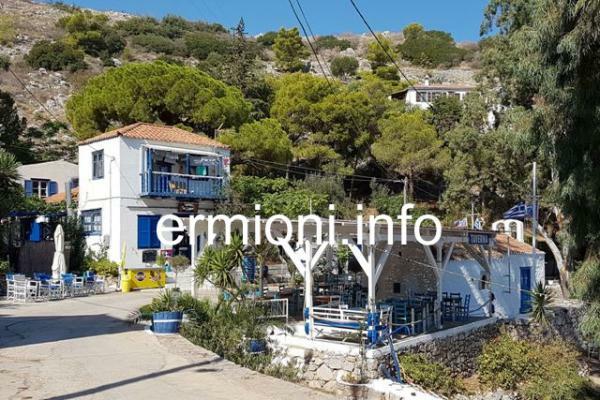 Road journey time from Ermioni to Metohi is approximately 20 minutes. When driving from Ermioni, look out for the Hydra > road sign on the right hand side, turn right here and drive towards the sea. You will approach two kiosks, where you buy your boat tickets, and a car-parking area (which is usually full during Summer) with the Hydra Lines Freedom II & Freedom III boat station at the far end of the jetty. You can park your vehicle along the roadside leading to the boats, or a shaded car-parking area is available in the official security controlled car-park, where the cost is 5 Euros per day. * Boy on a dolphin was filmed in the Autumn of 1956, and put on general release in 1957 by 20th Century Fox. It was the first Hollywood movie filmed in Greece and was Sophia Loren's first English speaking role when she was only 23 years old. The film featured the song S'Agapo (Ti'ne afto pou to lene agapi) duet by Sophia Loren and Tonis Maroudas. Filmed on location on Hydra, with scenes from Athens, Rhodes, Delos and Meteora, you'll see how much, or little, Hydra has changed over the last 60+ years. The steamship 'Neraida' used in this film was a passenger ship that linked Piraeus with Hydra/Ermioni from the 1950's to 1974. The totally re-fitted 'Neraida' made her final visit and voyage from Ermioni and Hydra back to Piraeus in September 2013 where she is operating as a floating museum.